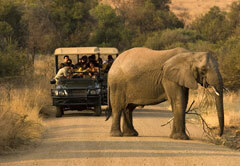 South Africa boasts a huge collection of wildlife regions and game parks; both public and private. Part of the magic of South Africa is that, as a country, it encompasses every possible landscape - from deserts to forests to mountains to coast. 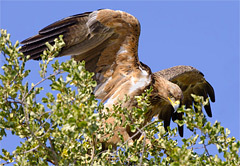 And each of these landscapes is home to its own variety of wildlife and birdlife species. So, the game reserves and national parks of the country reflect the same variety in their fauna and flora. South Africa is the proud home of no fewer than 20 national parks. This includes two of the world's most famous wildlife reserves, the Kruger National Park and Kgalagadi Transfrontier Park. In addition, there are numerous private game reserves that have massive biodiversity and world-class safari opportunities. A South African safari is high on the bucket lists of many travellers, and promises endless memories and adventure. Africa's Big 5 can be found at many of these parks and reserves, and are always particularly special to see in their natural environments. The Big 5 is made up of the leopard, lion, buffalo, elephant and rhinoceros. Of course, these impressive animals share their habitats with thousands of other fantastic species; including giraffe, kudu, hippopotamus, cheetah, zebra, ostrich, wildebeest, bushpig, and many more. All of the members of the Big 5 can be seen at the Hluhluwe-Imfolozi Game Reserve, Kruger National Park, Pilanesberg Game Reserve, Madikwe Game Reserve, Addo Elephant National Park, Sabi Sand Reserve, Shamwari Game Reserve, Timbavati Game Reserve, Kapama Game Reserve, Thornybush Reserve, Welgevonden, and Balule Nature Reserve. Visitors that want to see hundreds of African elephants up close as they feed and drink at the watering holes should head to Addo Elephant National Park in the Eastern Cape, just an hour from Port Elizabeth. If it's the mighty buffalo that you’re keen on seeing in its natural habitat, visit the Pilanesberg National Park in the North West Province. One of the best places to see prehistoric-looking rhinoceros is at the Hluhluwe-iMfolozi Park in KwaZulu Natal or Aquila Game Reserve (a few hours outside Cape Town); while lions can be found in abundance in the Kruger National Park. Leopards are shy, often hiding from visitors, but for the best chance to see them, try the Sabi Sands Game Reserve adjoining the Kruger Park. 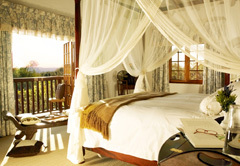 Many of the reserves offer overnight accommodation including safari experiences. Accommodation offered at South African Game Lodges ranges from rustic to 5-star luxury; from self-catering bush camps to fully catered lodges. Packages often include daily game activities, day and night game drives in an open-air vehicle with experienced guides, bush walks, horse-back safaris, river cruises, and other wildlife activities. A stay of 3-4 nights is usually recommended. 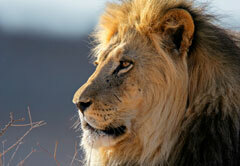 Guided game drives are excellent ways to spot the widest variety of animals. The experienced guide will share information and insights about the animals and the countryside, and will answer your questions along the way. They may even track some of the more elusive or exciting species that the safari-goers may otherwise have missed. Guided game drives are usually done in the early morning or evening, when different species emerge to find food and water. Self-guided game drives are often available too, particularly in the National Parks; giving visitors the opportunity to explore the parks and reserves at their own pace. Some reserves require a 4x4 vehicle to negotiate rugged areas, while others (like Addo and Kruger National Park) are easy to navigate in a sedan or a 2x4. Visiting the South African national parks and game reserves is an experience that is unique for each visitor. It touches you in a special way to look into the soulful eyes of an elephant or to watch as giraffe reach high into the trees to get the sweetest leaves. Breathe in the fresh, pristine air of the bushveld and savour the raw, wild adventure that is Africa. South Africa's inbound tour operators specialise in tailor-made safari packages and daily excursions of South Africa and her Wildlife Reserves. Whether you are a seasoned traveller to South Africa or visiting for the first time, enjoy the diversity of this region with the security, convenience, flexibility and knowledge that these professional companies offer. View all game reserves by province, indicated with red markers on the map below. Blue markers show some of the most popular game reserves and national parks in the country.